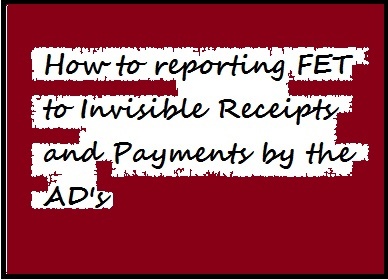 How to reporting FET to Invisible Receipts and Payments : The invisible part of foreign exchange transactions covers a large number of items. The major part of remittances on account of invisible receipts and payments are recorded through the Authorized Dealers’ (ADS) foreign currency accounts (Nostro Accounts) or through the Taka Account of non-resident bank branches or correspondents (Vostro Accounts) maintained with them. This reporting system plays an important role in the compilation of national Balance of Payments as well as management of foreign exchange position of the country. iii) Other investment income (interest). ii) Donations & Grants etc. i) Capital transfers (investment grants in projects). For details of the above classifications, the concerned code lists (i.e. code-5 and code-7) for reporting foreign exchange transactions by the authorized dealers. may please be consulted. Relevant Schedules for Reporting Invisible Transactions. a) Schedules for Inward Remittances. i) J-l= For reporting amounts equivalent to US$ 2000 and above, for reporting current A/C transactions, supporting Form C to be attached, covering purpose codes from 0001 – 5999 of’ ‘Code-5’ of the code list. ii) J – 2= For reporting amounts equivalent to above US$ 2000 and above, for reporting capital A/C transactions, supporting Form C to be attached, covering purpose codes from 6001-9999 of code ‘Code -5’ of the code list. transactions, no supporting Form to be attached, covering purpose codes from 0001-5999 of ‘Code-5’ of the code list. iv) IRV-2: For reporting amounts below $ 2000, for reporting capital A/C transactions, no supporting Form to be attached. covering purpose codes from 6001-9999 of ‘Code-5’ of the code list. Schedules relating to Wage Earners’ Remittances to F.C A/C. v) FCR-1 = F.C. remittance through banking channel, drafts, T.T.etc. vi) FCR-2 : Receipts through non-resident Taka account. vii) FCR-3 : Drafts, TCS. etc. locally deposited into FC Account. Conversion from other Foreign Currency. x) EFCR-I: Receipts by way of transfer out of export receipts as foreign currency Retention Quota of the Exporters. (For relating schedules from SL. No. V-X no supporting Form is required). i) E-3: For reporting Current A/C transactions, T/M Form to be attached covering purpose codes from 0001-5999 of ‘Code-7’. ii) E-4: For reporting Capital A/C transactions, T/M Form covering purpose codes from 6001-9999 of ‘Code-7’. iii) FCP-3: Payments (debits) for passage cost from foreign currency Accounts. iv) FCP-4: Release (debits) from Foreign currency Accounts for travel expenses. v) FCP-5: Miscellaneous payments in foreign currency. vi) FCP-6: Purchase by ADs from F.C Account holder for transfer to S-l.
vii) FCP-8: Exchange, transfer and adjustments schedules including sales to Bangladesh Bank. viii) FCP-9: Exchange, transfer and adjustments schedules including sales to Bangladesh Bank. It may be noted that for reporting the transaction under the F.C A/C of wages Earners, the Head Office of the concerned authorized dealers will submit separate summary statements FCS-7 in duplicate in a consolidated form being supported by the relevant FCR and FCP schedules to Bangladesh Bank. Head Office, Dhaka. Miscellaneous payments out of Exporters Retention Quota A/C (T/M form to be attached). Schedules (j-1, J-2, and E-3, E-4) those are required to report remittance (both inward and outward) have been provided with Columns’, Amount’, ‘Country’,’ Purpose’, ‘category/Department’ (in the case of outward remittances) etc. These columns should be properly filled in as per description given by the beneficiaries in the respective supporting Forms (i.e. Forms: C & T.M). While schedule-IRV- I & IRV-2 (for inward remittances) are to be filled in without any supporting Form. For coding Country, purpose, category etc. the respective code lists should be consulted to provide appropriate codes. The currency code, period code and Authorised dealers’ code should also be provided in the appropriate spaces of the schedules. It may be remembered that in case of remittances received by the foreign Missions and International Bodies in Bangladesh, the country of the Mission concerned and the name of the International Bodies should invariably be coded in the country column of the concerned schedule, regardless of the place from where the funds have actually been remitted. In the case of invisible transactions regarding encashment by EPZ industries to meet their local expenses ADs should report it in normal summary summary & schedules as invisible receipts, where the country code should be of EPZ (i.e. 2998). It may be noted that schedule J & IRV are supposed to cover only invisible receipts other than Export receipts. Similarly, Schedule E-3 & E-4 are supposed to cover only invisible payments other than Import payments. With a view to reporting foreign exchange transactions properly and accurately, the Ads should take utmost care in this regard. They should have well trained team of working hands for this purpose. From the observation or the statistics Department, Bangladesh Bank, Head office, it is very often found that the reporting of monthly foreign exchange transactions are not consistent with the country, purpose, Department/category codes as per requirement. The concerned beneficiaries of the remittances should be requested to provide full particulars of the transactions in the supporting Forms (i.e. Forms. C & T/M). The personnel concerned of the ADs should avoid any concealing or conniving practice while reporting the transactions.